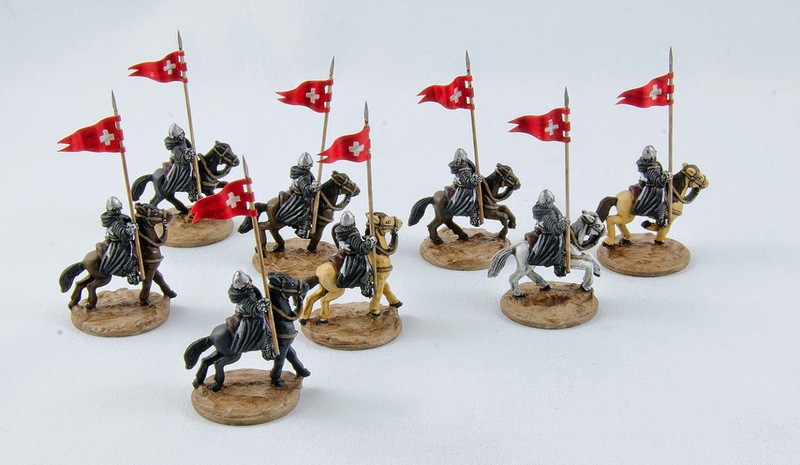 Cameron's Tiny Little Men: Hospitaller Hearthguard complete, project done! 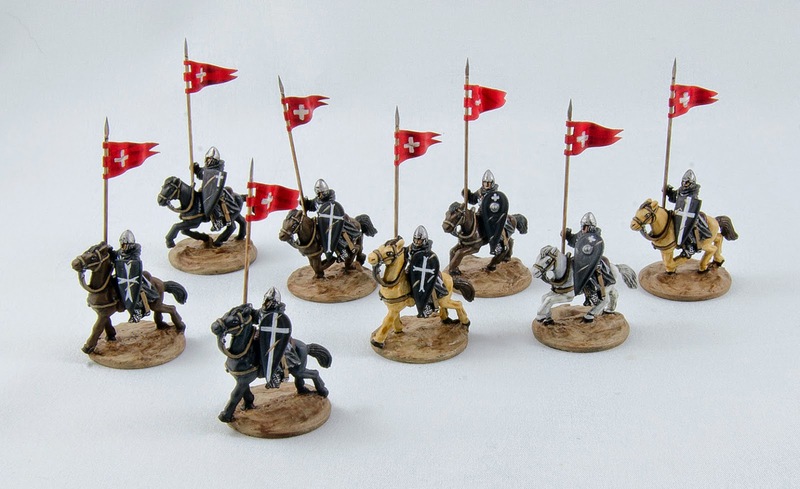 Last night I put the finishing touches on my 2 units of Hospitaller mounted Hearthguard for Saga: Crescent & Cross, gloss varnished them, matte sprayed them, and took some photos. As with the standard bearer, I was unsure about adding pennants to the knights' lances, but it serves as a good way to distinguish the Hearthguard from the Warriors - and as a nice visual indicator to my opponent that they are in really big trouble. I used wire spears on these guys again, and I'm much happier with these than the cast pewter spears that came with the unit. They will be less prone to bending, and they are properly stabby. Don't go reaching for my miniatures without due consideration, or you're likely to end up perforated. With these guys finished, my 15mm C&C warband is complete. I have figures enough to field any reasonable size force, with good flexibility to refine the composition as I learn the particulars of the force in the game. The Saga rules regarding miniatures are loose enough that I could field any of my figures as Warriors or Hearthguard, depending on how big a unit I want and how many points I want to use up. - Pilgrims and two units of mounted Warriors. They look great. I really like how the flags turned out. Are they commercial ones or did you wizard them up in photoshop? Do you back them on foil or just use glue to keep the form? None of the above. They are just paper folded over on itself, glued with white glue, and painted by hand. I curled them into shape and they stayed, and should be pretty solid now that I have a layer of gloss coat on them. Most impressive job, great looking hearthguard! 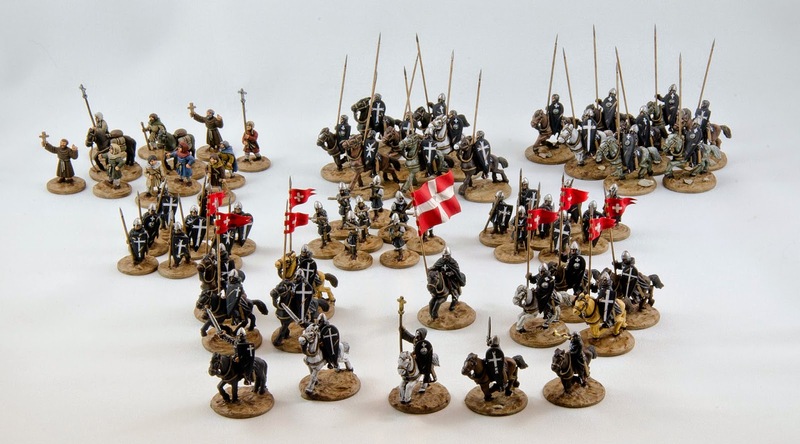 Really awesome stuff, I feel like starting some 15mm SAGA forces now.